Fort Worth Fabric always put together a weekly bundle which they feature on their website every Friday. 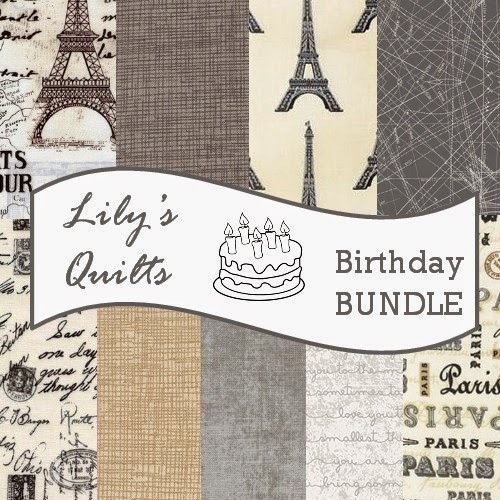 This week they have put together an additional bundle, Lily's Quilts Birthday Bundle , especially for my birthday tomorrow. You can find my nine FQ birthday bundle here and can buy it for $24.74 or comment below to try to win the bundle which will be given away ten days from today. A lovely mix of low volume Paris themed prints, you can find my nine FQ birthday bundle here and can buy it for $24.74 or comment below to try to win the bundle which will be given away ten days from today. So just leave a comment wishing me a happy birthday for tomorrow and I will pick a winner on 13 October when I'm back from the Knitting and Stitching Show in Alexandra Palace, London! Happy birthday!!! Have fun at the show! Happy Birthday for tomorrow, Lynne - hope you have fun at the Allie Pallie Show. Wishing you a very Happy Birthday, Lynne! This is a fun bundle and a great way to celebrate. Thanks for the chance. Happy birthday for tomorrow, it was mine yesterday! I wish you a happy birthday. I hope you'll enjoy it. Sunny and warm birthday wishes from me too! Be blessed and enjoy your new year, hope it will be filled with lots of laughter, love and creativity. What a great bundle -I love textured neutrals. Wishing you a fabulous birthday, have a great day! Love the fabric choices! Have a wonderful birthday! I so enjoy your blog--thanks for sharing all the ideas! Have a great birthday tomorrow, Lynne. Love the low volume fabrics. Happy birthday! Going on a trip is a fun way to celebrate. Those fabrics are gorgeous too- I have my eye on a pp owl pattern that they would be perfect for! Happy happy Birthday :-) and enjoy the show! Aww happy birthday to you! I'm sorry, I'm a bad Auntie. I should remember your birthday. Have a wonderful day. Enjoy some piece and quiet. Happy Birthday! Love the low volume prints. The Paris prints remind me of my time living in France. I miss it! Wishing you a great birthday! You put together a wonderful collection. Thanks!! "Happy Birthday Lilly" I hope you have a lovely Day. I really would like to win your Birthday bundle..
Wishing you a fabulous birthday week. As we get older we get more time to savor our blessings. (I'm old enough for a birthday month). The bundle is so lovely. Thank you for sharing this happy time. Have a wonderful birthday and a great time at the show! Lovely bundle, thanks for the chance to win! Happy Birthday, hope you have a lovely day! HaPpY BiRtHdAy! Mine is on Sunday! Would love to celebrate with your bundle! Happy Birthday, and enjoy the show! Happy Birthday! Love the bundle. Be safe and have fun on you trip. Thanks for the chance. Wishing you a happy birthday and a great time at Alexandra Palace. Thanks for the chance to enter the draw for the birthday bundle. Ohh La La, that is stunning. What a great birthday present. Thanks for this opportunity and enjoy your wonderful gift. Happy birthday! Love that bundle! A VERY Happy Birthday tomorrow to you! (And to me too!) We share the same day! Must be a good day for quilter's to be born on! Hope you have a wonderful day! Have a wonderful and happy birthday tomorrow! Thank you for the giveaway! A very happy birthday to you! Have a great day. Buon Compleanno Lily. Too bad the bundle isn't an Italian theme. But I'll takearis any day. Enjoy your special day. Very nice bundle, would love it. Happy birthday and great bundle! If I'm the winner, it will be your birthday bundle on my birthday (you're drawing on my birthday). Can you see my fingers crossing? Yay for October birthdays! Lovely bundle! Wishing you the happiest of birthdays! Oct 13 is my brothers so maybe I will get lucky!! thank you! Hi, Happy Birthday hope your day is a wonderful one. I love that bundle, thanks for a chance. Have fun at the show. Happy birthday wishes and enjoy the Knitting and Stitching Show. They are a lovely selection of fabrics. Happy early birthday. You have certainly chosen some gorgeous fabrics. Happy Birthday! I've been following you quite awhile and enjoy reading your posts. Wishing you a happy birthday - great fabric bundle. Have a great birthday!! What a wonderful treat for your birthday - a beautiful fabric bundle (loving those low volume prints) and the Knitting and Stitching show. Doesn't get much better than that. Have a great time. A very happy birthday and enjoy the show in London! Thanks for the giveaway! Have a fabulous day and see if you can stretch it out to the end of next week and maybe beyond! Those are a really good pick together for neutral colors. It's make a great woodsy/tree type blanket. They are dreamy! Happy Birthday! Hap-py Birth-day to take! (Stevie Wonder is singing 8-) Thanks for sharing! It's a lovely bundle of Paris. Hap-py Birth-day to *ya* , not take!! Happy Birthday! I love the Paris bundle. I'll have to make something using it for my mom and me for when we take a trip there this spring! Happy Birthday! Here's to another wonderful and creative year! Happy bday!!!! To many more quilty years!!!! Happy Birthday! Love your fabric picks! Happy Birthday! Wish you a day filled with love, laughter and fabulous fabrics! Happy birthday! Have a fantastic show. These fabrics are super, especially for me who loves France. Happy Birthday! Hope the show was good! Happy Birthday! My birthday is October too! Go Libras! What a wonderful birthday present from you to one of us....have a delightful birthday celebration in England! Here's hoping you have a very happy birthday! Happy Birthday, Lily! October is a great birthday month. (In addition to you, my sister, an aunt, my husband and a nephew all have BDs this month!) Hope your BD is very special and that the coming year will be a happy and healthy one for you! P.S. I love your birthday FQ bundle! Happy Birthday! I'm a libra too - but I have 10 days until my birthday. I hope you have A GREAT Birthday, Mine is on Sunday!!! Libra's are crazy!!! Have a great day! HAPPY BIRTHDAY!! My baby of the 6 will be 20 on the 19th. Happy Birthday to you. Happy Birthday to you . . . . I hope you have a wonderful celebration! Thanks for the chance to win this awesome fabric! A very Happy Birthday and a great big thank you for your very generous giveaway. Thanks for the giveaway! I very Happy Birthday to you! Happy belated birthday. How lucky you are to be going to the knitting show. The bundle chosen for your birthday is lovely. Thanks for the giveaway. Happy Birthday! Great bundle - ah, Paris! Have a great birthday, Lynne! Love the low volume fabric. What a great low volume from Ft Worth Fabrics, especially since Paris is included -- I love that shop! Happy birthday. Unfortunately I can't go to Knit & Stitch this year as I'm going to Venice. A palace in London AND a stitching show? How could you not have a wonderful birthday? But I'll wish you one anyway. Happy Birthday and enjoy the show! Just a message to say HAPPY BIRTHDAY!!! Happy birthday Lynne - hope you have a fabulous day and have fun at the stitching and sewing show ! That's a lovely bundle, very sophisticated! Have a wonderful birthday! Have a fabulous birthday and year ahead. Love your birthday bundle of fabrics. I hope you habe a happy happy joy joy type of day! Wonderful bundle, thanks for the opportunity! Happy birthday! May it be full of sewing. :) Love those fabrics! Birthday Girl!! Hope it is a good one. I just turned the ripe young age of 62! Happy Birthday! Thank you for the chance to win. Happy birthday and thank you for the giveaway! 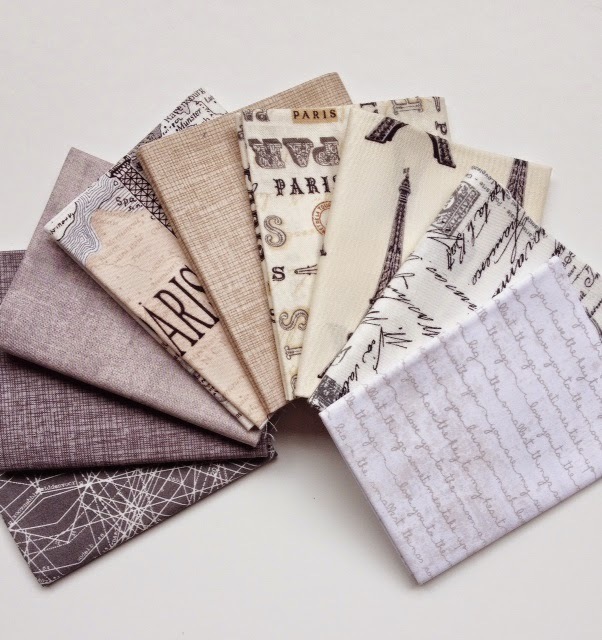 This is the nicest Paris themed fabric bundle that I have seen. Happy Birthday from Texas! Hope your day has been wonderful! Have a great bday and the fabrics are sweet! HAPPY BIRTHDAY to you HAPPY BIRTHDAY too you Mine is Sunday! Happy Birthday! Love the bundle! Whoop whoop! Happy happy birthday! Have a wonderful day and trip! Happy Birthday! In your honor I'm shopping at Fort Worth now!! HAPPY HAPPY BIRTHDAY!! Lotsa fun & Special Blessings!!! What a perfect birthday bundle! Happy birthday! Have so much fun in London! Happy Happy Birthday to you! Your birthday bundle is great. What a lovely bundle of fabrics to celebrate your birthday! All the best. Well, HAPPY HAPPY BIRTHDAY TO YOU. Beautiful bundle of fabrics. Have a wonderful trip! Happy Birthday!! Hope it was a great day. happy Birthday and I hope you have a marvelous time in London. Thanks. Hope you had a great BIRTHDAY!!!!! Have a Great Birthday and Lots of fun! Happy birthday....great way to celebrate! A birthday and wedding anniversary in the same week, hope it's been a great one. Belated Happy Birthday! Beautiful fabric. Crossing my fingers for my number to be drawn. What a wonderful birthday trip. So happy for you. Happy birthday! Hope you have a great trip. Happy Birthday! Hope you have a wonderful time! Thank you for the chance to win these lovely fabrics. Happy Birthday!!!! Thanks for sharing the presents. Happy Birthday Friday! And I love Paris and your fabric choices! Happy Birthday to you! The fabric is gorgeous - I love Paris! Thanks for the chance to win some. Happy Birthday, hope its fabulous!!! My daughter is going to Paris the week after Christmas :) I would love to make her some special travel bags for the trip. Happy belated birthday! I made my first trip to Paris this past spring and it was wonderful beyond my dreams! Happy Belated Birthday! I would love to visit Paris - someday! A happy belated birthday Lynne! Hope you had a fab time celebrating and looking forward to catching up in London - you'll have to let me know if you need any food/drink supplies bringing!!!!! I really like the colors in this bundle! Happy, amazing birthday!! Happy birthday. I hope you have a great day. A belated happy birthday to you! October is such a busy birthday month for our family. Your bundle is lovely. First off Happy Birthday mine was just yesterday the 5th! This is a beautiful bundle! Hope your birthday was fabulous. Thanks for the giveaway. Happy Birthday! Have a great trip. Bon Anniversaire! A great collection. Hope you have a wonderful birthday!! Great fabric choices for your giveaway!! A very happy birthday to you! I bet you had fun at the show!! Happy birthday, Lynn. I love following your blog. Thanks for sharing all of your talents. Happy Birthday. I hope it was a fun filled one. Happy Birthday! Hope you had a blast! Hope it was a great show and birthday! my birthday was Sunday, Oct 5th, what a great belated birthday surprise it would be to win those fat quarters! hope your birthday was a good one. I love the low contrast. in the fabrics. Hope you birthday was nice. Happy Belated birthday. Hope you had a great time at the festival! Love the prints for the bundle! Happy belated birthday! The fabrics are gorgeous, thank you for the giveaway! Happy birthday! I hope you had a great day. I love the colors of the fabrics.